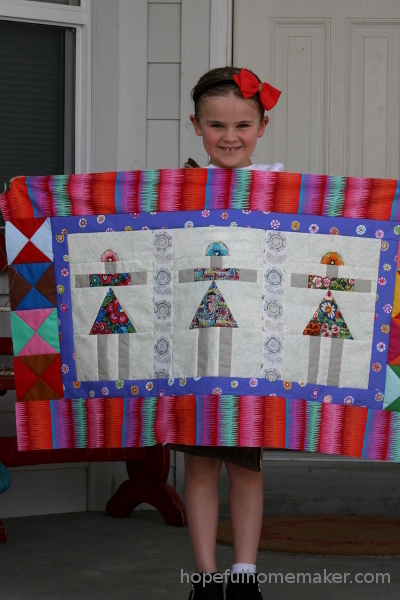 My sisters and I have decided to make traveling quilts together this year. We each made a center and swapped them last month. For the longest time I couldn’t decide what I wanted to make for my starting block, and then inspiration struck. 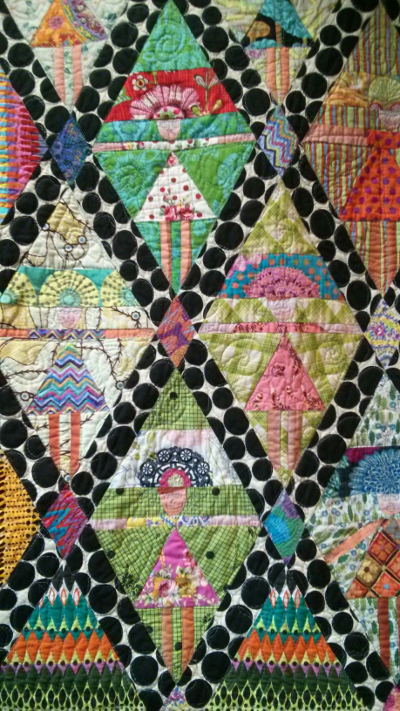 I loved seeing Kathy Doughty’s Diamond Dollies quilt last year when she taught in Utah, and so the pattern had been on my to-do list for a while. I decided this was the perfect chance to try it out and make three sisters to start things off. Originally I had planned to try the diamond setting, but when I made the dollies I increased their size just a bit and ended up liking them as they were. The pattern for making them is in Kathy’s book, Adding Layers. I couldn’t find flesh colored fabric anywhere so I used a soft brown. 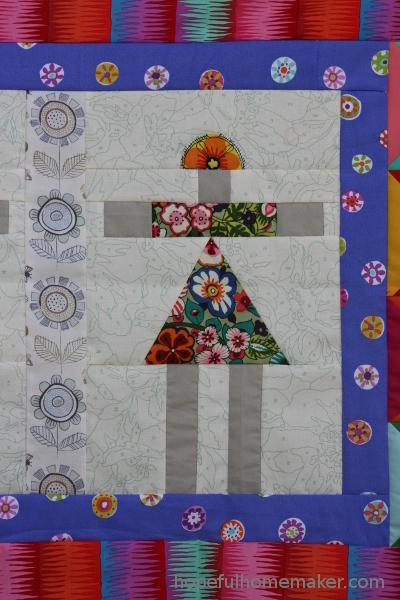 The dolls came together pretty quickly, and I appliqued their round hats on before assembling the blocks. It was kind of funny how long it took me to find fabrics I liked for the borders; I auditioned so many prints and ended with a big pile on the floor before I pulled out that purple print. When I added the Kaffe mirage stripe the whole thing said YES and I went with it. It’s funny how many fabrics you can try before you get that yes, but I love waiting for it anyway. So worth it. 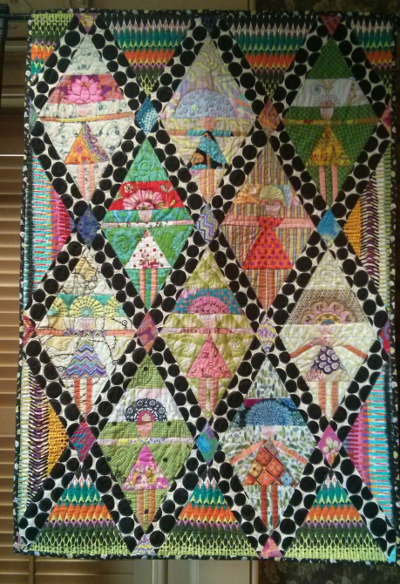 The hourglass blocks on the sides were left over from my Dream Catcher quilt top, also a pattern by Kathy. They were the perfect size and added some whimsy so I happily used them. 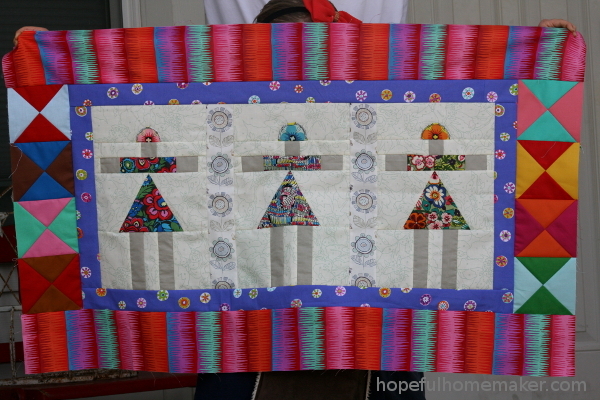 I told my sisters that I want this quilt to celebrate sisterhood. I’m so excited to see how it changes as they add to it, and so excited to work on this project together. I think it will be really fun for each of us to have a quilt we all worked on, that reminds us how great it is to have sisters. It’s pretty great to have a cute seven year old, too. Love her smile.